I wrote this story several years ago when I was still maintaining an herb garden at the house I was living in at the time. The garden no longer exists, but the memories of days spent carefully tending the various plants still linger in my mind and heart. One of these days I will have a new garden…and possibly a new love to share it with. Growing herbs has never been a business venture for me, although there was a time when I had visions of actually going into the herbal business – selling herbal crafts and food products at local herb gatherings, farmers markets, craft fairs and the like. Rather, it’s personal…as personal to me as the many memories I have accumulated over the years in my gardening projects. Gardening seems to come naturally to me – after all, what you can expect from a gal whose grandparents both owned farms; the daughter of a “good ole country boy,” a lass raised on homegrown sweet corn and fresh tomatoes ripe from the vine? My father used to tease me about my “pokey stick” method of planting sunflower seeds (developed when I was a budding gardener at the age of six, and which some 40-odd years later, still has yet to fail me)…and to this day, I am still the only family member who has ever been able to grow cucumbers successfully – even in a pot on an apartment balcony. Speaking of cucumbers, my Grandfather Wolzenski – being of Polish descent – made the world’s best pickles, and always planted his own dill for that purpose. He passed away several years ago, but I still whisper a little prayer in his name when I transplant dill into the garden. 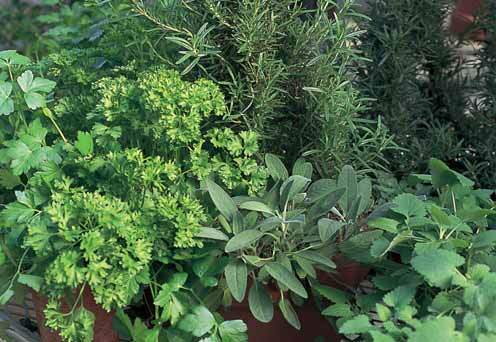 Considering my early upbringing into the wonderful world of dirt, I got into herbs at a ripe old age. I suppose it began when I started studying earth-based faiths. Pagans have a reverence for nature, and a special affinity for those plants which find their way not only into culinary and medical usage, but into our spiritual practices as well. Many Pagan retreats have herb gardens, and I can still close my eyes and envision myself back at places such as Circle Sanctuary or Camp Gaia…inhaling the heady scent of various herbs as I stand within the gardens, watching a summer sunset. But perhaps my true affinity for herbs comes from the realization that, for someone born without normal hearing, they make the perfect Deaf-Friendly plant. Let’s stop and think about that for a moment. True, one doesn’t need to hear to enjoy plants. But as a Deaf person, my other senses get put to good use as a result of not being able to hear. Herbs appeal to all of those senses…with their various colors and shapes – the bright red blossoms of a pineapple sage, the perky little stars of sweet woodruff – they are pleasing to the eye; their wonderful fagrances tickle our noses – just try inhaling the scent of lavendar! Their various flavors, whether sweet, tangy, lemony, or refreshing delight our taste buds. Deaf people tend to be quite tactile – we tap each other to get one’s attention, we hug each other during greetings. Herbs practically BEG to be touched. Brushing against a lemon verbena releases its sweet citrus scent, rubbing a leaf of peppermint reminds one of childhood trips to the candy store. There’s the softness of lamb’s ears, the pebbly texture of sage, the spikey bushiness of rosemary. What better plant for a deaf person than an herb? Not only do herbs appeal to my senses, they also appeal to my philosophy of life. I find herbs a perfect way of introducing people to Deaf Culture, to teaching them about our ways. They teach us about diversity, and acceptance. They allow me to share with others our differences, and yet our similarities. There’s the slim, round, spikey leaves of onion chives versus the flat, broader leaves of the garlic variety – which teaches the diversity one finds not only in herbs…but also in people. Different…and yet the same. 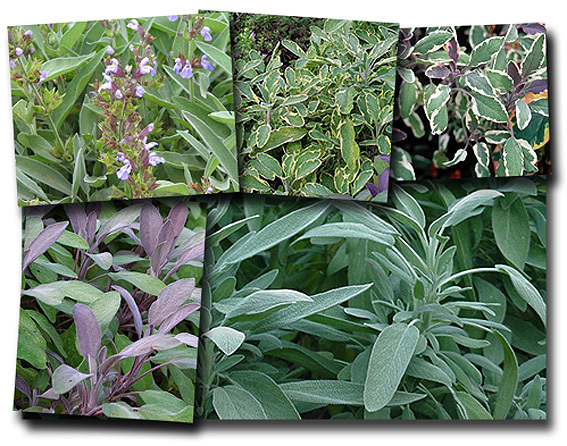 Golden sage, purple sage, common sage, and tri-colored sage teach us this same lesson. What beauty can be found in the many different colors! If we have no problem with the mixing of the different colors of sages, or bee balms, or lavenders, or thymes in our gardens…then why should the mixing of different people, with different colors and different cultures and different backgrounds and different abilities be so difficult? Why do we look forward in excited anticipation to the new variety of a plant we introduced in our gardens, but shirk in fear at being introduced to a new person perceived as being different? Ahhhh yes…if we would only treat people with the same love and kindness as we do the herbs in our gardens, the world would be a much better place. No doubt a fear that crosses many people’s minds is how to communicate with a person who uses sign language. But we herbalists speak a language all of our own – a language that is taught to us by the plants we propagate. Herbs do not need a voice in order to communicate, and neither do we. I have been able to take an individual on a tour of my garden without uttering a sound. By pointing out the bees buzzing around the blossoms, visitors learn the more common name for monarda. Sniffing and tasting a leaf introduces them to lemon balm, as well as the various kinds of mint. It’s almost impossible not to recognize the heady scent and spikey purple blossoms of lavender. I get a little help from a visual aid with the catnip…it sprawls over a clay figurine of a sleeping cat – placed there as a reminder of its main purpose in pleasuring the felines of the household. By the time we have passed under the climbing rose arch, walked by the foxglove, and seated ourselves in garden chairs on the little brick patio, a bond as been formed – a bond that surpasses communication barriers, cultural differences, or perceived disabilities. We are simply people celebrating the useful plant…reveling in the miracle of nature and all its glory. Such is the magick of herbs. Have I ever told you, mum, that when you go on these long walks down memory lane which in actuality is a lesson, that not only do I read your beautiful words, I see them to? I love reading anything you have to say and you make things so easy to understand. When I read your bloggs or even on AIM you make me realize that even though I think I’m so ‘mature for my age’ that I still have so much growing up to do, and I don’t even see it. This so makes me long for spring… Already here in North Alabama, the buttercups are starting to bloom… a whole month early! My herbs in my garden have stayed strong this winter, but we haven’t had very cold weather yet… Oh, and my method of planting sunflowers is by poking the seeds in the ground with my finger, up to the first joint… LOL My maternal grandmother could turn a stick into a tree, and this magik passed my mother over, and landed on me. I’m so glad I have transplants of her flowers in my garden, as she passed this fall, and my mom will probably kill everything in her yard! Unintentionally, of course, but she just isn’t gifted with plants. Now, she is the type of person who can take something apart and put it back together… not me, give me dirt under my fingernails, bugs in my face, and cats hiding under my wisteria vine.. Gardening is indeed quite therapeutic…but getting a good massage after pulling all those weeds can be even nicer! While you are quite mature for your age, yes dear…you still have some growing up to do. Don’t be in such a hurry, Tasha. You have the rest of your life to gain that wisdom and experience. When you’re ready to go play in the dirt, just give me a buzz. What a lovely, soothing story. Ohhhh yes…the attack of the Zukkie Monster! Those things really know how to reproduce, I agree with you on that…I’ve made the mistake of planting too many zuchinni plants and having them green gremlins growing all over the place. Was eating so much zuchinni it was coming out of my ears – fried zukes, steamed zukes, stuffed zukes, zukkie casserole, zukkie bread…you name it, I probably made it. But I agree – there’s something satisfying in working with the earth and caring for nature’s bounty.